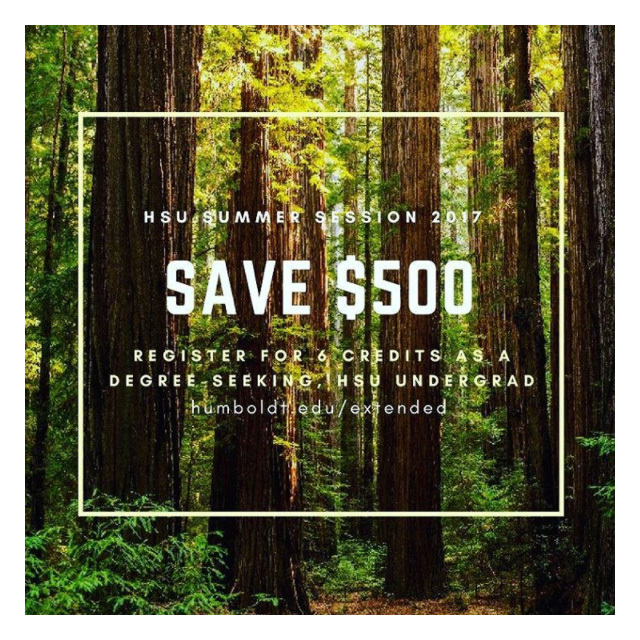 HSU students who sign up for summer classes can save $500 on registration fees by registering for at least six units. The offer is available through the College of eLearning & Extended Education for currently enrolled HSU students seeking a degree. Registration is easy and can be completed through Student Center, HSU’s student portal. Classes are $289 per unit during summer session and the discount is automatically applied once a student has registered for six or more units. “Students should also know the discount isn’t need-based. Even if you haven’t filled out a FAFSA, you’re still eligible to save $500,” says Sheila Rocker Heppe, the director of College of eLearning & Extended Education. More than 65 classes offered fulfill general education, institutional, or prerequisite requirements. For more information, including a full class listing, visit humboldt.edu/extended or dial 707-826-3731.